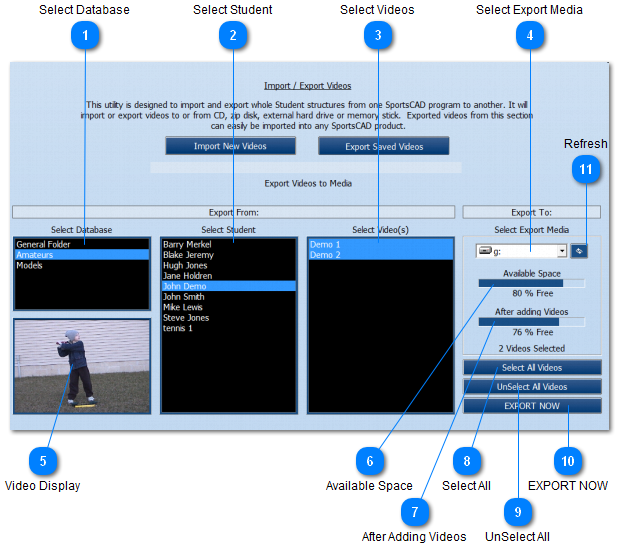 A) Select the database (1), student (2), then the videos (3) you want to export (do the same for all students or models you want to export). B) Select your export media (4) (where you want the videos to go which is usually the “D” drive for cd). The percentage bars (6 and 7) will show you the space left before and after adding videos. C) Press the “Export Now” button. The software will let you know when it is finished burning or copying the files. Note: If you don't see your thumb drive in the dropdown list, click the Refresh button (11) and try again. Select the videos that you want to export. Use the Select All button (8) to select all of the videos. Select your export media. This can be a cd, external hard drive, thumb drive etc. The Video Display will show the currently selected video. This percentage bar shows the total available space on your export media. This percentage bar shows the total available space on your export media AFTER the export. Use the Select All button to select all of the videos for the selected student. Use the UnSelect All button to unselect all of the videos for the selected student. Click the Export Now button to begin the export process. The software will let you know when the process is complete. This button will refresh the Export Media dropdown list. Plug in your thumb drive, click the Refresh button, then select the thumb drive in the dropdown list.